Xfinity Store by Comcast best nearest you. Visit our local Xfinity Store to find the best deals on XFINITY services. Keep your phone. Upgrade your network. Check compatibility and learn how to make the switch. Offer ends 6/23. 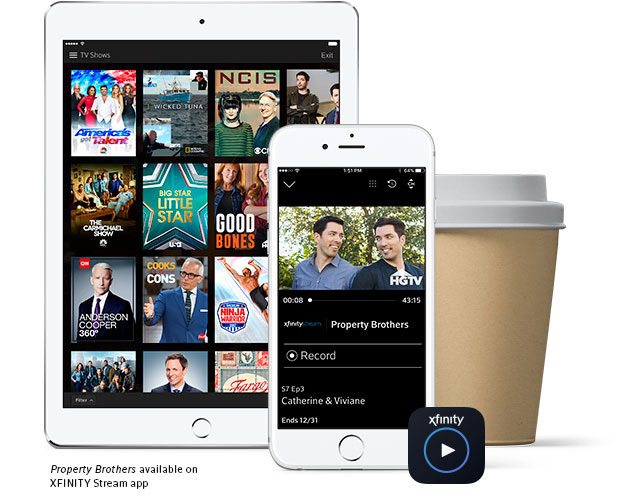 Xfinity Mobile requires a post-pay subscription to a residential Xfinity Internet service. Limited to up to five lines. Initially limited to up to two lines under a device payment plan, pending activation of Internet service. Equipment, international and roaming charges, taxes and fees, including regulatory recovery fees, surcharges, and other applicable charges extra, and subject to change. $10 per line monthly charge applies if at least one of the following post-pay subscriptions are not maintained on the account: Xfinity TV, Internet or Voice service. Pricing subject to change. Actual speeds vary and are not guaranteed. After 20 GB monthly data use, speeds reduced to a maximum of 1.5Mbps download/750 Kbps upload. By the Gig: Data charge applies to each GB or partial GB of shared data used. Savings comparison limited to regular monthly service charges for Comcast’s data options and the weighted average prices of comparable Verizon, AT&T, T-Mobile and Sprint plans, based on published rates as of January 2019. Actual savings vary and are not guaranteed. Bring Your Own Phone prepaid card offer ends 6/23/19. Limited to select eligible iPhones. Must activate a new Xfinity Mobile line for that phone and port phone number to the new Xfinity Mobile line within the first 30 days of line activation. Must remain an Xfinity Mobile customer with an account in good standing and maintain the new Xfinity Mobile line for the first 90 days following Xfinity Mobile line activation. Prepaid card issued by MetaBank®, Member FDIC, pursuant to a license from Visa® U.S.A., Inc. Prepaid card mailed to Xfinity account holder within 16-18 weeks of activation of all required services and expires in 180 days. Not valid with previously activated lines. May not be combined with other offers. Limited to five phones and up to $500 in prepaid card amount per customer/account. If multiple lines ordered, one card issued for the total qualifying amount. The Xfinity Mobile logo and “o” marks are trademarks of Comcast. © 2019 Comcast. © 2019 Apple Inc. All trademarks are the property of their respective owners. All rights reserved. Looking for Xfinity Stores in another area? Enter the ZIP Code or city and state. Get advanced speed, coverage, and control on your home WiFi network. Save on TV and fast Internet. Plus, quickly access Netflix and more with our best entertainment experience, Xfinity X1.